For the purpose of forming a truly affluent infrastructure and contributing to regional development and promotion of tourism, a wide range of studies are conducted to help improve the quality and value of roadside and other public spaces, which are affected by infrastructural development. Specifically, studies are conducted mainly on the creation of good landscapes as part of the development and management of infrastructures, as well as their use in tourism. Consideration of landscapes is required for public projects conducted by the Ministry of Land, Infrastructure, Transport and Tourism (MLIT), and technologies to meet these requirements are becoming necessary. The national government is also promoting the establishment of a tourism-oriented country as the New Growth Strategy. Since tourism is one of Hokkaido’s key industries and the number of both Japanese and overseas tourists who enjoy driving and the roadside landscapes is increasing, the prefecture is expected to contribute to the growth strategies of both the national government and MLIT. Meanwhile, investment capability for road improvement is decreasing with an increase in maintenance and renewal costs due to financial shortages, and an increase in and aging of infrastructure stock in recent years. Therefore, it is necessary to establish efficient road improvement, maintenance and control technologies that can ensure the necessary functions while at the same time being landscape friendly. In this study, an evaluation technology for sequence landscapes of roads will first be developed through clarification of the evaluation structure for such landscapes. Next, multidimensional evaluation will be conducted on the landscape and other functions, and the costs of the elements of road spaces currently designed and established in accordance with various establishment criteria, for the purpose of optimizing road spaces including their landscapes. In recent years, street spaces and station squares of cities have been improved for tourist promotion and revitalization of downtown areas. However, in many past cases, improvements have not contributed effectively to the creation of actual activities, due to insufficient consideration to users’ impression assessment and improvements in comfort levels in terms of improving the attractiveness of pedestrian spaces. Accordingly, it is necessary to develop evaluation methods and design technologies for pedestrian spaces that can contribute to improvements in the attractiveness of tourist spots and downtown areas, based on the relationship with users’ special recognition, impression assessment, walking behavior and other factors. Against the above backdrop, this study aims to present evaluation methods and design technologies for attractive pedestrian spaces through field observation, comparative experiments and verification of users’ spatial recognition and walking behavior. The results are expected to help create pedestrian spaces that can contribute to regional promotion, in the form of technical data for identification of specific problems and appropriate design support in improvement of pedestrian spaces. In Hokkaido, where tourism is a key industry, the number of tourists driving rented cars is increasing yearly. In particular, the number of such overseas tourists has increased dramatically, making this area of tourism internationally competitive. Since traveling distances are long in Hokkaido, roadside stations are particularly important as roadside rest areas, and it is also known from past studies that such roadside stations have significant influence on the satisfaction levels of self-drive tourism. However, since current emphasis is on the sale of goods and supply of food and drinks, the response to the needs of rest areas is insufficient. Against such a background, this study presents specific measures to improve the attractiveness of roadside stations as rest areas, through fact-finding surveys and interviews with users, while developing a method of establishing attractive roadside parking facilities. With the recent establishment of the three laws on scenery and greenery and Basic Act for Promoting a Tourism-Oriented Country, infrastructural development is required to contribute to landscape improvement, regional revitalization and promotion of the tourist industry. Meanwhile, due to the current difficulty in investment into public works projects, it is becoming increasingly necessary to disclose the results and other details of individual projects. Against such a background, this study aims to clarify the social effects of good landscapes in Hokkaido and other rural areas in a systematic manner, by identifying the influences and effects of good landscapes and landscape improvement measures on local communities, and setting guidelines on the improvement in value and ripple effects that can be achieved by individual landscape formation. These results are expected to contribute to the support for consensus building in landscape projects and urban development. In Hokkaido, the development of footpaths has recently been promoted, mainly by local residents. 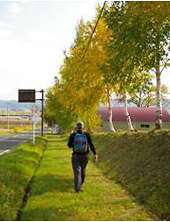 Since the New Hokkaido Comprehensive Development Plan also states “promotion of development of footpaths and other facilities making use of the most charm of Hokkaido’s natural environment” as one of its strategic targets, the utilization of infrastructural spaces is expected to contribute greatly to future footpath development. Against such a background, this study clarifies the social effects of footpath development and discusses the reduction of traffic barriers in road and river improvement/management, and the improvement in attractiveness of spaces to achieve more effective utilization of infrastructural spaces. 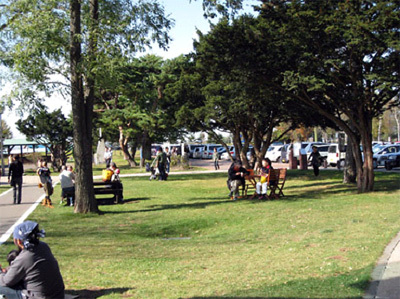 Social needs for improvements in roadside landscapes are increasing due to the establishment of the Basic Act for Promoting a Tourism-Oriented Country (2008), as well as high expectations on regional revitalization through promotion of tourism, and the positioning of attracting overseas tourists as a new growth strategy of the national government. Roadside landscapes, on which regional impressions depend significantly, are affected greatly by roadside power lines and utility poles that are installed in large numbers. They have an especially strong influence on diminishing regional appeal, especially in Hokkaido, where beautiful landscapes provide the background for many roads. Roadside utility poles cause many other problems, such as hindrance to traffic safety and maintenance/management. While conversion to underground power lines and other measures have been taken in urban areas, almost no landscape measures involving power lines and utility poles have been taken in suburban areas. However, it is considered highly likely that studies of landscape measures involving suburban power lines and utility poles will contribute to the solution of these problems, since there are many other landscape improvement methods in suburban areas besides underground power lines, and it is possible for local governments to take independent measures using subsidies for public works. 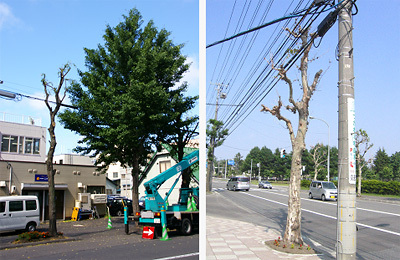 Therefore, a study on effective methods of minimizing the hindrance to landscapes by power lines and utility poles in suburban areas of Hokkaido will be promoted by sorting/systematizing the current problems and presenting landscape improvement methods that are considered effective, based on field surveys and analysis of influences on landscapes. Regional revitalization through the establishment of a tourism-oriented country under the New Growth Strategy of the national government and creation of internationally competitive tourist spots under the new Comprehensive Development Plan of Hokkaido are among the main policy objectives. Much “urban development” activity through tourism has recently been observed in Hokkaido and other parts of Japan, in expectation of regional revitalization. The number of Japanese and overseas tourists using rented cars is increasing. The increase in the number of overseas tourists that drive has been especially significant in recent years, and a further increase is expected in the future. The number of elderly drivers is also increasing yearly. Therefore, it is necessary to introduce universal information and guidance systems that are easy for non-Japanese and elderly people to understand, and such systems are also expected to contribute to the creation of attractive tourist spots. However, since the current criteria for information and guidance systems were established many years ago and are not sufficient to deal with the current increase and diversification of tourist traffic, independent measures concerning such systems are being taken in some regions. Meanwhile, there are also cases in which the use of too many signs results in an actual reduction in the effect of such information, or causes hindrance to landscapes in tourist spots, and these problems have been pointed out by Ministry of Land, Infrastructure, Transport and Tourism committees. Since guidance by information signs alone has its limitations, it is necessary to develop easy-to-understand space design in which spatial structures and other facilities supplement each other. Therefore, this study includes sorting/systematization of problems concerning information and guidance systems mainly from the viewpoint of users of tourism-related traffic, consideration of effective landscape-friendly systems, surveys on understandability of spaces and presentation of effective information and guidance methods in combination with space design. Against such a background, this study identifies problems and research needs associated with infrastructural development using regional resources, and discusses study methods through collection and analysis of past measures taken in Hokkaido and examples of advanced areas in Japan and overseas, as well as through exchange of opinions with scholars and intellectuals. Tourism is a key industry in Hokkaido. Many domestic and overseas tourists visit the island for its beautiful landscape and other features. In particular, the number of self-drive tourists from overseas is increasing rapidly. Social needs for improvements in roadside landscapes are also increasing with the full-scale implementation of the Scenic Byway Hokkaido scheme. Therefore, this study focuses on the landscapes (internal landscapes) of roads that serve as main transport routes and important viewpoints, and presents road scenery evaluation methods and improvement measures, as well as highway landscaping methods that can contribute to landscape and environmental improvement. We aim to contribute to the improvement of roadside landscapes in cold, snowy areas through these studies. There are many suburbs in Hokkaido where natural and rural landscapes of world-class beauty can be enjoyed while driving on roads. However, snow-protection and various other roadside facilities also exist to ensure safe and smooth traffic and maintenance/management of roads, blocking the view of beautiful landscapes that extend behind them. Against such a background, this study presents specific landscape improvement measures that can lead to cost reductions, easier maintenance/management and landscape conservation, for the purpose of effective improvement in road landscapes in cold, snowy regions. Such measures include “landscape creation by subtracting,” which aims to reduce facilities while maintaining necessary road functions. These achievements have been used as the basis for development of the Road Landscape Database and Road Landscape Checklist in Hokkaido (draft). With the recent increase in landscape improvement efforts in public works projects, road landscape evaluation is becoming increasingly necessary, and the necessity of consensus building based on discussions with relevant parties is also increasing. However, since no road landscape evaluation methods have been established and there are no unified guidelines or standards, difficulties are encountered in landscape examination and consensus building. If a road landscape evaluation method can be used as a guideline that reflects subjective personal feelings to a certain degree, it can be an effective tool to facilitate landscape examination and consensus building. Therefore, this study aims to present a road landscape evaluation method that can be applied as a tool for landscape examination and consensus building. An example of a road landscape evaluation method (combination of personal impression and quantitative evaluation) Applicability was improved by reflecting the impression evaluation by the SD method and improving the image recognition method in fractal analysis. Roadside trees, slope vegetation and other roadside greenery greatly affect roadside landscapes and environments. However, highway landscaping involves a variety of problems, such as securing of planting sites and selection of tree types. There are especially many problems concerning maintenance/management, which is required for many years after planting. Whether the effect of planting can be fully displayed or not depends on the quality of maintenance/management. However, due to recent attempts to reduce maintenance costs, excessive pruning is conducted in some areas to reduce the frequency of which underbrush clearing and tree trimming takes place, resulting in the reduced function of roadside greenery. Cold, snowy regions also have regional problems, such as poor growth and slow progress of natural succession due to severe weather conditions and damage caused by mechanized snow removal. Against the backdrop of the establishment of the three laws on scenery and greenery, and increasing social demands, this study aims to present a highway landscaping method that can also contribute to the landscape, environment and reduction of maintenance costs. Left: The naturally shaped tree on the right is pruned gradually like the one on the left, resulting in loss of leafy shade in summer. Right: Due to excessive pruning to avoid power lines, there are never any green leaves, even in June. Many self-drive tourists are visiting Hokkaido, and in particular, the number of such tourists from overseas is increasing. However, tourists from outside of Hokkaido tend to plan unreasonable itineraries as they are unfamiliar with the local geography, lack a sense of distance and have insufficient information on local conditions, such as snowfalls on mountain passes in spring and autumn, and the supply of information to support their driving plans is necessary from the viewpoint of traffic safety. Meanwhile, since winter snowstorms cause road closures and multiple collisions in Hokkaido, it is also necessary to provide information to ensure the safety and comfort of road users under severe weather conditions. Against such a background, this study combines official road information with regional information in a sophisticated manner to present a method of supplying information depending on the situations and user needs in all seasons. In Hokkaido, the number of overseas tourists that drive rented cars has increased dramatically in recent years, and this tendency is expected to continue in the future. Realization of an attractive driving environment for overseas tourists will lead to higher international competitiveness of Hokkaido’s tourism industry and contribute to the promotion of regional tourism. Some tourism-oriented countries are active in promoting road tourism for overseas tourists. Therefore, from the viewpoint of promoting road tourism for overseas tourists in Hokkaido and the rest of Japan, a study on the creation of universal and attractive touring environments is to be conducted to realize internationally competitive self-drive tourism. Since there are many aged drivers in rural areas of Hokkaido due to insufficient public transport, this study will also be important for senior citizens faced with similar barriers.